As your parents age, you will need to deal with some sensitive issues concerning their lives. Part of this will focus on discussions that no one wants to have. Things that often come up include their ability to drive, their finances and even health issues that they may be experiencing. To effectively deal with these issues and not seem too cold or overbearing, it’s important that you look at the “best practices” when dealing with common senior issues. You will then need to decipher where your aged parent falls on the spectrum and what type of caregiver you have become. You may need to look inside yourself and make some changes in order to be the best advocate for your aging parents. One of the hot button issues that children of aging parents will need to deal with is freedom and independence. At some point, for example, seniors may have to give up driving. It could be due to failing eyesight, conditions like arthritis and even due to mental conditions. Many seniors will not like this and as their child and/or caregiver, you will need to know how to handle it. You need to address the situation in a sensitive way and show that you understand where they are coming from, but for their safety, be stern in the decision. You also need to show them that there are other options. One way that children of the elderly might deal with this is to purchase their parent a pass for public transportation. Many communities also have transportation specifically for seniors. These buses stop at community locations such as a grocery store, local senior center and post office. With this, you will feel better knowing your parent won’t be on the road, and they will still have some sense of freedom. Speaking of freedom, another thing that seniors will crave is independence. This is something that you should allow them as much as possible. When you were a teen, you wanted your freedom from them. This time, the tables are turned, and they might want freedom from you. There are many things that you can do to give your senior parent the freedom they need and deserve. One way is to sign them up for classes in the community. Another is to drive them and a friend to the mall or park. You also want to make sure they have their own space in the house, whether they live with you or alone. This space will give them much needed privacy. Finances are another hot button item that can be difficult to talk to your elderly parent about. Many times, aging parents feel as if it isn’t your business. That being said; you still need to come to a compromise, especially if you notice signs that they aren’t keeping up with their money. Some of these signs are late notices in the mail, calls from collectors, letters from the bank or your parent asking to borrow money. If you notice these, you should sit down and talk to your parents, whether you like it or not. If your parents have decided to not let you be a part of their finances, you may want to suggest a trusted family member or friend who may be able to help. If that doesn’t work, there may be community organizations to help. If they want to work with you, come up with a plan so they still have some responsibility for their finances, but it shouldn’t be a burden on them. Many times, an extra eye on the checkbook can bring less worry and more financial benefits than they had before. Many children of senior parents eventually notice that their parent’s health is declining. You might see your parent getting sick more often or you may have a medical scare like a heart attack. Your parent may fall; they may not be grooming themselves, or their home might be messy and unkempt. If any of these signs appear, you must sit down with your parent and have a discussion. Though neither of you will be thrilled with the talk, odds are that your parent knows their health is declining too and fighting with all their might to stop it. Unfortunately, what’s done may be done, so you will need to find a solution against it. One thing that many families choose to do is hire a companion or even home health care for their parent. With a companion, for instance, your parent will have someone at home with them. This person can help with things like cooking, cleaning and even transportation. They are typically more apt to accept this type of help because they see this person as more of a friend than as a caregiver. 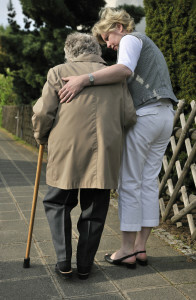 Finding the right combination of caring for your parent yet allowing them to make their own decision can be difficult. With the information presented above, however, you can easily come to a place where their safety and wellbeing are at the forefront.